On September 30th hip-hop/R&B rising star B.o.B will help kick off the first annual National Gen44 Summit with President Barack Obama. Hey, nothing gets aspiring politicians and government leaders pumped up about the future of our nation like rousing love ballads and wistful anthems about Beautiful Girls and Airplanes, right? Let’s hope so. Editorial Note: Article first published as B.o.B Joins President Obama to Kick Off National Gen44 Summit on Blogcritics. The inaugural Gen44 Summit, is a three day gathering created by the Democratic National Committee to cultivate and empower a rising generation of leaders. The event will take place in Washington, DC at the historic DAR Constitution Hall. 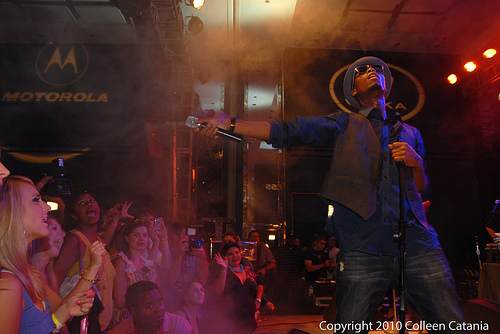 If B.o.B ’s performance is anything like his show at Perez Hilton’s Pre-Lollapalooza One Night in Chicago bash earlier this year at the Hard Rock Hotel, then President Obama and the DNC are in for a great show. And considering the state of the union, B.o.B’s anthems will hopefully inspire the DNC to come up with a plan to steer the nation and the next generation toward a promising future. Will President Obama Rock the Stage Again? It’s been awhile since we’ve talked about President Obama’s ability to rock the stage and inspire other musicians to do the same in the name of Change, so I’m curious to see how B.o.B’s Gen44 Summit performance emotionally moves Obama. Will everyone be as moved as the Perez Hilton crowd (video below)? And I’m equally curious to see how the next generation of political leaders and activists are impacted as they watch our President sing along and get lifted by B.o.B . Maybe there will be some live concert leadership going on? That said, I hope someone gets footage of President Obama and the rest of the aspiring young democrats swooning and wishing along to B.o.B’s hit song “Airplanes.” Maybe B.o.B has plans to unveil a new special tribute song for the First Lady, like Lady Tigre did for Michelle Obama in 2008 with the excellent electro-soul tribute “Black First Lady”? For full details and ticket information about the Gen44 Summit, visit the genfortyfour site or mybarackobama.com. How Has B.o.B Moved You Live? Tell your story and share your favorite B.o.B concert experiences in the comments below. And check out more exclusive Live Fix fan stories and interviews here.